A Tu-95 strategic bomber has crashed during training flight 80km from the city of Khabarovsk, eastern Russia, the Defense Ministry said. “The flight was being conducted without ammunition. The plane fell in deserted area, there is no destruction on the ground,” says a statement from the ministry. The crew ejected from the aircraft before the crash, it added. The incident happened near the aviation ground of Litovka, 60km from Khabarovsk, a source told TASS, adding that the suspected cause of the incident is the failure of three power units. Currently An-12 transport aircraft and Mi-8 transport helicopters have been deployed to reach the crew, a source told TASS News Agency. According to the sources, the strategic bomber exploded and was entirely destroyed. The rescuers found five crew members of the crashed aircraft, the Defense Ministry told TASS, adding that the search for two others is still underway. 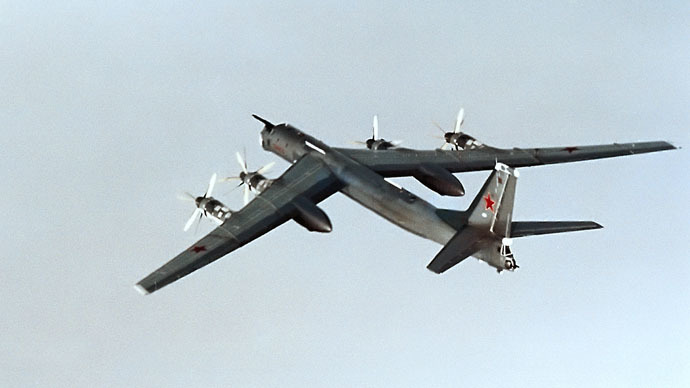 The Russian long-range ‘Bear’ (Tu-95) is a large, four-engine strategic bomber. It entered into service back in 1956 in the Soviet Union and is expected to fly with Russian Air Force until at least 2040. It is capable of carrying up to 12,000kg of missiles, including a nuclear payload. In June, a Tu-95 overshot the runway after taking off in Russia’s Far East, resulting in injuries to several crewmembers. That incident prompted the Russian Defense Ministry to temporarily freeze all flights carried out by the aircraft.